I know that many people are looking for healthy recipes right now, but I figured that some of you may also be looking for dessert ideas for New Year's Eve. I made this cake for Andrew's grandmother's birthday, which was on Christmas day. It was her 90th (! ), so all eight of her children and their families were in town to celebrate. Since it was a large crowd, I made a chocolate cake with Nutella frosting in addition to this one. I figured these two cakes would please both chocolate and vanilla lovers. This vanilla cake is the "whiteout cake" from the Baked cookbook, so called because it is monochromatic, all white. It is exceptionally light (in texture, unfortunately not in calorie content) due to the addition of beaten egg whites, which are folded into the batter at the end. With its fluffy white chocolate frosting, it made a great contrast to the rich, dense chocolate cake, and was very popular at the party. Happy birthday again to grandma-in-law! This is probably going to be my last post of 2011. I wish you all a very happy new year! See you in 2012. Are you cooking something special for New Year's Eve? What are you making? Preheat oven to 325 deg F. Butter three 8-inch round cake pans, line the bottoms with parchment paper, and butter the parchment. Dust the pans with flour and shake out any excess. Sift together cake flour, all-purpose flour, baking powder, baking soda, and salt into a bowl and set aside. Using the paddle attachment on a stand mixer, beat together the butter and shortening on medium speed for 3-4 minutes. Add the sugar and vanilla and continue beating on medium speed until fluffy, about 3 more minutes. Add the egg and beat until just combined. Beating on low speed, add 1/3 of the flour mixture, followed by 1/2 of the ice water. Beat until just combined, then add 1/2 of the remaining flour mixture and all of the remaining ice water. Beat until just combined, then add all of the remaining flour mixture. Scrape down the bowl and beat for a few more seconds until mixture is well combined. In a separate bowl, whisk the egg whites and cream of tartar until soft peaks form. Gently fold the egg whites into the cake batter. Divide the batter among the three cake pans and smooth out the tops. Bake in the preheated oven for 40-45 minutes, rotating the pans halfway through, until a toothpick inserted into the center of the cakes comes out clean. Cool cakes in the pans on a cooling rack for 20 minutes, then invert the cakes onto the rack and remove the pans. Cool cakes completely, then remove parchment. Clean the bowl and paddle of the stand mixer before making the frosting. Melt the white chocolate in a double boiler or in the microwave (Microwave for 30 seconds on high, then stir chocolate. Microwave for another 30 seconds on high, then stir. Continue microwaving in 15 second intervals, stirring between each one, until chocolate is melted and smooth). Set chocolate aside to cool. In a medium, heavy-bottomed saucepan, combine the milk, cream, flour, and sugar. Cook mixture over medium heat, whisking frequently, until it comes to a boil and thickens, about 10 minutes. Transfer mixture to the bowl of the stand mixer and beat on high speed with the paddle attachment until mixture cools. Reduce speed to low and add butter 1 tbs at a time, mixing each addition until just blended in. After final addition, continue beating until butter is very well incorporated. Increase speed to medium high and beat until frosting is light and fluffy. Add the vanilla and white chocolate and continue mixing until combined. If necessary, refrigerate the frosting for a few minutes until it can hold its shape. Place one cake layer on a stand and trim the top to flatten the surface. Spread about 1 cup of frosting on top of the cake. Repeat with the second layer, then top with the final layer. Trim the top, then cover the whole cake with a thin layer of frosting (the crumb coat). 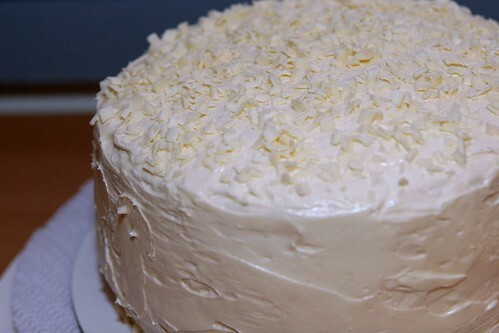 Refrigerate the cake for about 15 minutes to firm up the crumb coat, then frost the cake with the remaining frosting. Garnish the cake with white sprinkles, nonpareils, or white chocolate shavings. The cake can be kept in a cake saver in a cool, dry room for up to 3 days or can be refrigerated for the same length of time. Remove the cake from the fridge and let it come to room temperature (at least 2 hours) before serving. Looks lovely. I almost always choose chocolate over vanilla when it comes to desserts, but I do love vanilla and bet this cake is decadent with the white chocolate. Happy New Year! Lovely cake, Ranjani! I've just started cooking out of Baked Explorations, and their recipes are really fantastic. Happy New Year! I've liked all the recipes I've made from Baked - this looks so delicious too! Happy New Year! Beautiful! Love the shavings on top! I spend NYE at a friend's house and contributed an Asian-style tapas and cocktail. Happy New Years to you! Beautiful! I love the white choc shavings on top. Looks gorgeous! I have been wanting to try making that whiteout cake for a while now. This cake looks divine. I will have to try this soon! Awesome blog! I love the look and feel...and of course the food looks delicious...lucky I got to eat some:)and now I can try to make some too! Could you refrigerate this white chocolate frosting overnight and frost the cake the next morning (after bringing to room temp and rewhipping)? Thank you! I haven't tried it, but I think it would be fine - let me know how it works out for you!